Need More Huddle Room Space? – Check Your Video Camera Choice! What makes the PanaCast 3 such a revolutionary camera? The world’s first 180° Panoramic 4k plug-and-play USB video camera. Natural, ultra-wide field-of-view without the “fish-eye” distortion and with unparalleled visual clarity. High quality (UHD) frames of 3840 x 1088 pixels per picture. 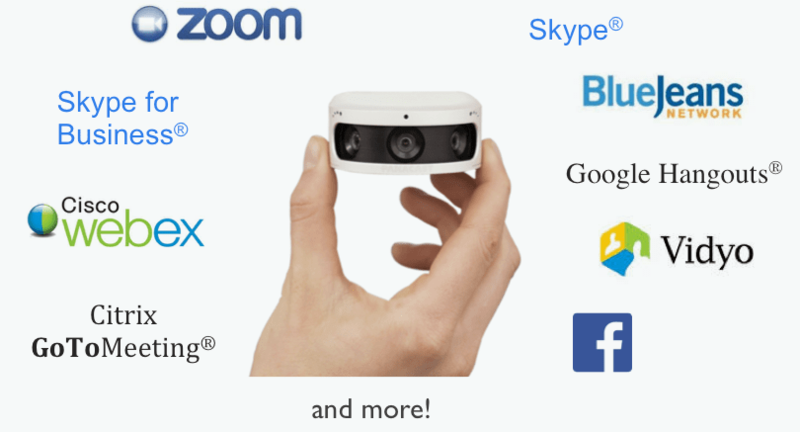 Compatible with all major soft video clients including Skype for Business®, Zoom, GoToMeeting®, Webex® etc. with no additional software needed. Reduced optical distortion makes it perfect for both small/huddle rooms and classrooms/lecture halls. More than 1800 organisations in 38+ countries are using PanaCast daily to improve their communication and productivity. Over 200 universities are now adopting the PanaCast for lecture capture and huddle room deployments. The need for more useful and innovative communication tools, enabling people to interact more successfully with remote colleagues, clients, suppliers and partners, is driving the growth of a new kind of video conferencing in the workplace – visual collaboration. A major challenge is making sure that everyone and everything that matter to the meeting or presentation is ‘in view’ and visible at the far end of the room. But, a small room with participants close to the display, or a large room set out in a wide classroom format, demands a camera with a field of view (FOV) much wider than standard conferencing solutions. A typical Pan/Tilt/Zoom (PTZ) camera has an FOV of just 60°- 90° so not all participants will be visible if the PTZ remains fixed in one position. This leads to the need for one person to ‘direct’ the camera throughout the meeting to make sure that the current speaker or the whiteboard is in view. And, of course no one wants to do this, so the camera remains static in one position and the experience at the far end is less than ideal. But, after 20 years, PanaCast cameras at last remove the tyranny of the PTZ camera and, for the first time, offers a full view of the room, its occupants and whiteboard surfaces - all without the need for any input from the participants. The outstanding PanaCast 2 camera stands out from the crowd! Read on to find out what makes it so great. Ultra-High resolution means, in a video meeting, you will see all participants and whiteboards, chalkboards or flip charts easily and clearly. Adjust the ﬁeld of view to whatever you need, whenever you need it – digitally. Download our ePTZ app for local Pan, Tilt, and Zoom features. All participants can be clearly seen no matter how close they are to the camera. Combines video streams from three imagers simultaneously to achieve an extended ﬁeld of view without sacriﬁcing resolution. PanaCast 2 works with all the major video services like: Zoom, Skype®, Skype for Business®, Ciscowebex, Citrix GoToMeeting®, BlueJeans Network, Google Hangouts®, Vidyo, Facebook and more. Takes up very little space (it fits in your hand) and is unobtrusive and easy to install. One cost for all uses. One product is all you need. Automatic Framing: The Intelligent Zoom feature ensures that all participants are appropriately framed even if people leave or join the meeting mid-call. For larger companies, small meeting rooms, not previously considered viable for video capability are now being pressed into service and these smaller rooms, or Huddle Rooms as they are becoming known, create real challenges not just in the demand for low cost solutions but also around practical factors of vision and sound performance. CISCO WebEx™, Google Hangouts®, Skype for Business®, Skype®, BlueJeans™, Zoom®, GoToMeeting®, Vidyo. For companies who have not yet adopted visual collaboration, there is a need for low-cost, enterprise-quality solutions that will work well in available meeting spaces. 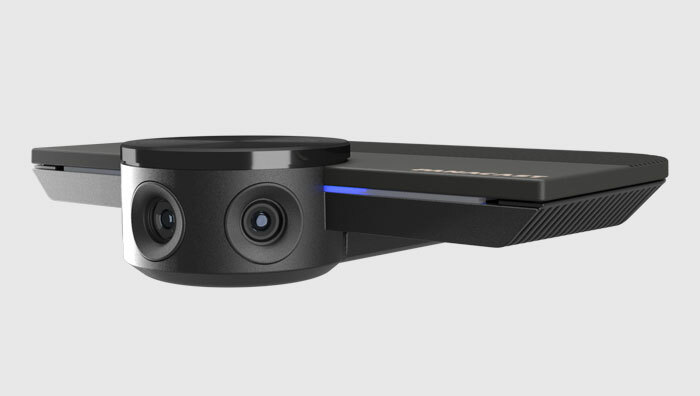 For classroom use in education or enterprise training rooms where a single, fixed camera needs to see the whole class or to cover the teacher as she/he walks between lectern/table and whiteboard. When the auditorium needs to be covered with a single fixed camera, the PanaCast 2 has both the field of view and the resolution detail to match the challenge. It can also easily cover the lecturer as he/she moves between the lectern/table and the whiteboard or blackboard. When there is a need to monitor and record a large space with a single camera view and have the ability to review any part of the image in HD quality. Subscribe to our Newsletter to stay updated with the latest information, new launches, community forum updates and so much more! © Copyright 2019 by InterMedia Communication Solutions. All rights reserved.